Free delivery and discount codes for use when shopping at Clarks for men's, women's and kids shoes. Get free delivery on orders over £50, free click and collect from store and free returns. Next day postage and packing available and up to 50% off RRP on brand shoes and boots. Clarks have been selling shoes since 1825 for all the family in choice of widths and sizes to suit all. Lots of great reductions across Men’s, Women’s and handbag styles. Delivered within 3 to 4 working days, saving £3 off the usual cost plus free returns. 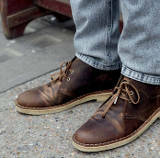 Clarks is a much loved global brand of quality shoes for men, women and children. Founded in 1825 their name is synonymous with quality and value they sell their shoes in over 150 countries worldwide. Parents trust Clarks to provide children with correctly fitted shoes as their feet develop and grow with lots of styles for both boys and girls. Clarks is the go-to place for all parents looking for school shoes. But it’s also the place for individuals to visit when they want good quality shoes at an affordable price. The Clarks website homepage changes throughout the year, depending on the current event. During the “back to school” season, this is the main focus, but during the autumn period, shoes perfect for the weather is the main priority. There are separate banners to make it easy to find shoes for particular needs, and even banners with the mid-season sale to find shoes at a lower price. Worried about getting the wrong shoes? Clarks understand that buying online can be nerve-wracking, which is why it makes it clear at the very top that it offers free returns. If you want to try before you buy, there is free delivery to the store so you can go in and pick up. Those who know exactly what they want can benefit from free delivery when they spend over £50, and next day delivery is available for a small extra price. The whole site is designed for people just too quickly shop, click, and buy. The only downside is finding the contact section means scrolling right to the bottom where the smaller text is.